Can robots see the future? Developing robots that understand what they see is the key to an array of emerging applications in robotics and automation. However vision is a complex process requiring rapid and continuous feedback for control. Robotics is a transformative technology with potential applications across a range of industries, including manufacturing, agriculture and construction. Automation can transform these industries, but only if it can perform complex interactive tasks in unstructured environments. We're working toward developing robots that perceive their environment: that sense, understand and learn in order to improve performance over time. Robots with visual perception - that can see and respond as humans do - will have the potential to increase productivity in industries critical to Australia’s economy. 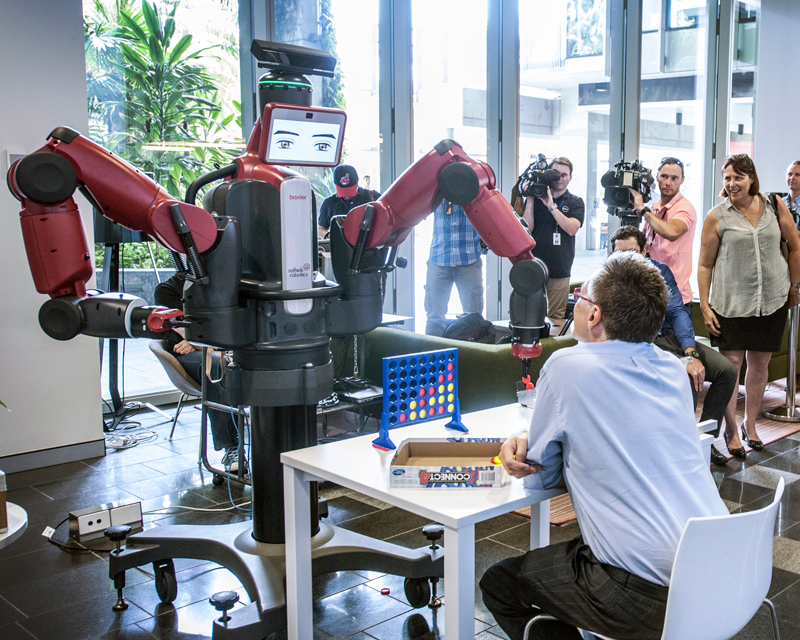 The Australian Centre for Robotic Vision is navigating the challenge of applying robotics in the real world. international universities and organisations including INRIA Rennes Bretagne, Georgia Institute of Technology, Imperial College London, the Swiss Federal Institute of Technology Zurich, and the University of Oxford. a free global university-level course in robotic vision, with over 30,000 students from 100 countries participating in the course so far. A visionary performance artist who has designed her own prosthetic limbs will visit Australia for the first time this weekend to share her approach to the body as art courtesy of QUT and the World Science Festival Brisbane (WSFB). Roll up, roll up to QUT’s Street Science! booth at the World Science Festival Brisbane (#WSFB2019) and have your portrait done by a robot, or find out about ‘Oobleck’, a seemingly ‘magical’ slime being used to create a shape-shifting protective beanie. QUT’s Robotics and Autonomous Systems research focuses on the development of technology that can be used to improve our understanding and management of the world around us and will benefit humanity. We conduct world class research, postgraduate training, industrial consultancy and product development in the areas of speech, audio, image and video technologies.